Analog Input Ground—The reference point for single-ended analog input measurements. Analog Input Channels—For single-ended measurements, each signal corresponds to one analog input voltage channel. 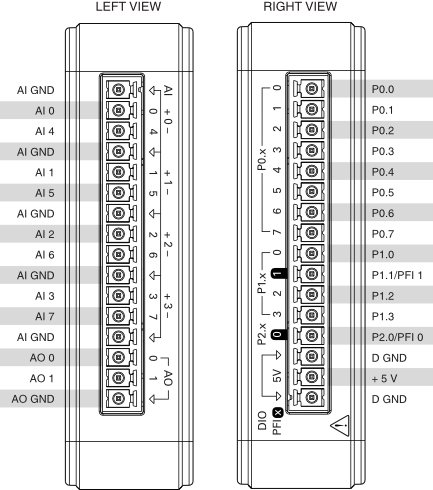 For differential measurements, AI 0 and AI 4 are the positive and negative inputs of differential analog input channel 0. The following signal pairs also form differential input channels: AI <1,5>, AI <2,6>, and AI <3,7>. Analog Output Ground—The reference point for analog output. Port 1 Digital I/O Channels—You can configure each signal individually as an input or output. Port 2 Digital I/O Channel—You can configure this signal as an input or output. Programmable Function Interface or Digital I/O Channels—An edge counter input or digital trigger input. Digital Ground—The reference point for digital signals. +5 V Power Source—Provides +5 V power up to 150 mA. Off Device is not connected or is in suspend. On Device is connected and functioning normally. Blinking Device has encountered an error. Wait 10 seconds to allow the device to attempt to recover from the error. If the LED continues blinking, disconnect and reconnect the device. If the error persists, contact National Instruments.